Expert Fire Sprinkler Maintenance from a company with over 30 years’ fire sprinkler experience. Our specially chosen fire sprinkler partner company can provide fire sprinkler maintenance on a reactive and/or planned basis via contract or quotation. Contact us for a fire sprinkler maintenance quotation. Just like Safesmart our specialist partner company for fire sprinkler maintenance works closely with all their clients and suppliers to ensure that a fully scheduled, efficient and cost effective service is provided at all time. They are also FIRAS certified for Commercial, Residential and Domestic sprinkler installations. 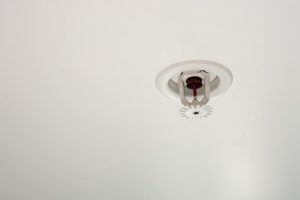 Good Fire Sprinkler Maintenance is Key. To ensure that the fire sprinkler system operates as designed it must be maintained in accordance with the requirements of the system design rules used. The design and fire sprinkler maintenance rules are very important to understand as these rules specify the maintenance intervals for the fire sprinkler system and the fire sprinkler components. As part of fire sprinkler maintenance water flow and pressure requirements can be tested and testing that water is discharged back to the storage reservoir. – Checking the pressure and flow of the water supply. – Checking that the functionality of sprinkler heads and pipework isn’t impeded. – Examining water and air pressure gages. – Inspecting the condition of sprinkler heads for paint, dust, or obstruction. – Maintain adequate heat within a dry sprinkler control valve room to prevent freezing. – Looking for damage to any part of a fire sprinkler system. Our specialist partner will ensure that the correct maintenance checks and maintenance action are taken to ensure your fire sprinkler system is in good working order. They have over 30 years’ experience solely in fire sprinklers and therefore can help you no matter what sector your organisation operates in. The fire sprinkler maintenance company we partner with has specialist fire sprinkler installation experience in the following areas: Education, Ministry of Defence, Healthcare, Film & Television Studios, Industrial, Hotels & Leisure, Office & Commercial, Retail, Warehouse & Distribution, Food Industry, Data Rooms, Waste & Recycling Plants. For the reassurance of expertise in consultancy and maintenance contact us for a fire sprinkler maintenance quotation. Contact us using the form below. We look forward to helping you.